HERE IS THE LINK WHERE YOU CAN SEE AND BUY THIS STUNNING GOWN! IF YOU WANT PURCHASE THIS GOWN AND DON'T HAVE EBAY ACCOUNT THEN YOU CAN EMAIL ME DIRECTLY AND BUY FROM ME DIRECTLY! HAVE FUN! Email me for MORE pictures and if you have any questions ! My direct email address is SnizhanaWillis@aol.com. Thank you! SAFE MANY THOUSANDS OF $$$$$$$$ DOLLARS AND OWN THIS EXTREMELY EXPENSIVE AND RARE GOWN FOR MUCH LESS!!!!!!!!!!!!!!!!!!!!!!!! THE BEST DEAL EVER!!!!!!!!!!!!!!!!!!!!!!!!!!!!!!!! WOW!!!! MY LOSS IS YOUR GAIN!! !ABSOLUTELY GORGEOUS AND STUNNING GOWN! VERY FLATTERING TO THE FIGURE!!! FULLY beaded in SWAROVSKI CRYSTALS from head to toe. Designed by Sherri Hill of Jovani. Red Carpet Collection. Only ONE made in country. IT HAS A SWAROVSKI CRYSTALS NECKLACE CHOKER FOR A UNIQUE LOOK! THE FABRIC IS VERY RICH LOOKING, IT IS VERY SOLID AND EXPANSIVE SATIN. THIS GOWN WAS PURCHASED LIKE A SPECIAL ORDER, CUSTOM MADE BY SHERRI HILL AND ORIGINALLY COST $$$4,500.00 DOLLARS$$$$$$$$$$$$$$$$$$$$$! EXPERT TOLD ME THAT NOW THIS GOWN WORTH $3,000.00 OR MORE EASILY, WORK IS JUST UNBELIEVABLE. MYSELF AND ANOTHER EXPERTS KNOWS THAT THIS GOWN WORTH MUCH MORE $$$$$$$$$$$$$$$$$$$$ BECAUSE JUST SWAROVSKI CRYSTALS ON THIS GOWN WORTH OVER $3,000.00, I'M NOT INCLUDING SOLID AND EXPANSIVE SATIN FABRIC, UNIQUE AND BEAUTIFUL DETAILS AND HAND WORK. THIS GOWN IS ONE OF A KIND!!!!!!!!! THIS GOWN IS A REAL WORK OF ART!!!!!!!!! GREAT FOR ANY PAGEANT SYSTEM! REALLY RARE GOWN! CANNOT SAY ENOUGH ABOUT THIS BEAUTY! THIS PRICE IS A STEAL!!!!!!!!!!!!!!!!!!!!!!!!!!!!!! SO HURRY AND GET IT NOW!! !My asking price is $900 or Best Offer. Email me for MORE pictures and if you have any questions ! My direct email address is SnizhanaWillis@aol.com. Thank you! Designed by Sherri Hill of Jovani. Red Carpet Collection. Only ONE made in country. IT HAS A SWAROVSKI CRYSTALS NECKLACE CHOKER FOR A UNIQUE LOOK! THE FABRIC IS VERY RICH LOOKING, IT IS VERY SOLID AND EXPANSIVE SATIN. THIS GOWN WAS PURCHASED LIKE A SPECIAL ORDER, CUSTOM MADE BY SHERRI HILL AND ORIGINALLY COST $$$4,500.00 DOLLARS$$$$$$$$$$$$$$$$$$$$$! EXPERT TOLD ME THAT NOW THIS GOWN WORTH $3,000.00 OR MORE EASILY, WORK IS JUST UNBELIEVABLE. MYSELF AND ANOTHER EXPERTS KNOWS THAT THIS GOWN WORTH MUCH MORE $$$$$$$$$$$$$$$$$$$$ BECAUSE JUST SWAROVSKI CRYSTALS ON THIS GOWN WORTH OVER $3,000.00, I'M NOT INCLUDING SOLID AND EXPANSIVE SATIN FABRIC, UNIQUE AND BEAUTIFUL DETAILS AND HAND WORK. THIS GOWN IS ONE OF A KIND!!!!!!!!! THIS GOWN IS A REAL WORK OF ART!!!!!!!!! GREAT FOR ANY PAGEANT SYSTEM! REALLY RARE GOWN! CANNOT SAY ENOUGH ABOUT THIS BEAUTY! THIS PRICE IS A STEAL!!!!!!!!!!!!!!!!!!!!!!!!!!!!!! SO HURRY AND GET IT NOW!! !My asking price is $900 or Best Offer. Email me for the pictures and if you have any questions ! My direct email address is SnizhanaWillis@aol.com. Thank you! At NES Nationals everyone goes home feeling like a Queen or Princess with a crown or tiara, EVERYONE!!!!! FREE Coaching Clinic immediately following Talent Competition in the ballroom! Open to all interested contestants! 13 Years of Pageant Training! Learn how to do an elegant beauty walk or an upbeat, fun swimsuit, fitness or casual runway walk! Georgianna has appeared in Film, Television, Audio Book Recordings & Stage Productions! Contact Miss Georgianna by clicking on the banner or come to the ballroom immediately following the talent competition! Nothing is Like an OPP Shoot, Book yours today! Order Yours Today Only $30! our store for more Boutique Bracelets Here! *LOW $595.00 ENTRY FEE! 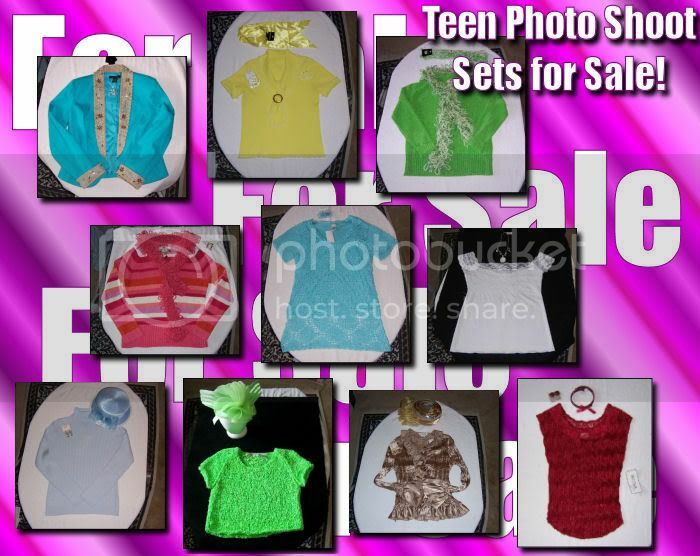 Includes state/regional crown banner, hotel, meals, swimsuit/ aerobic wear, opening number outfit and much, much more. Awarding over $50,000 is cash, prizes, professional photo shots. $3000 cash bond to each National Queen. ARG WILL BE AWARDING OVER $15,000 IN PRIZES AND OVER 50 SUPREME TITLES. GIFT BAGS FOR ALL SUPREME WINNERS. ONE LUCKY WINNER WILL RECEIVE A PRIZE PACKAGE WORTH OVER $2,300 INCLUDING A $2000 BOND. TONS OF GIFTS AND PRIZES.. EVERY CONTESTANT WILL RECEIVE A PERSONALIZED SPECIAL GIFT. 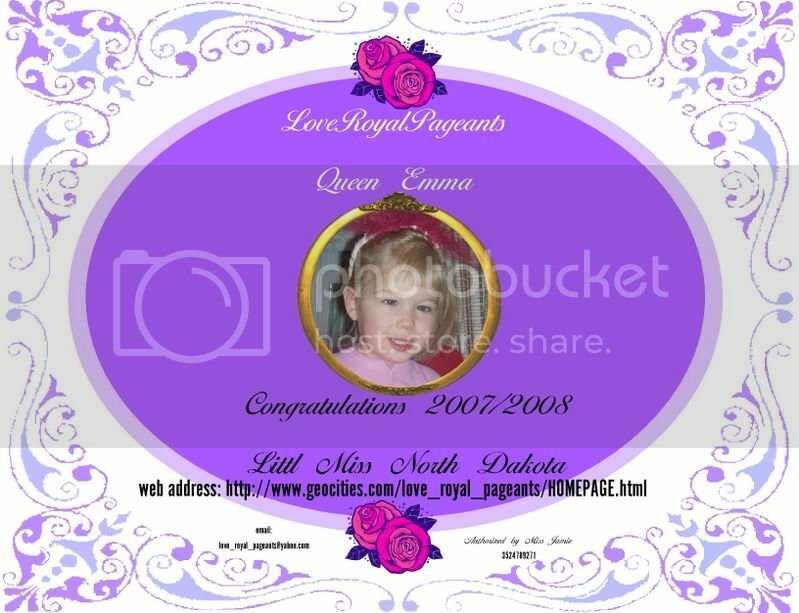 OTHER AWARDS INCLUDE PORTABLE DVDS, DIGITAL CAMERAS, MP3 PLAYERS, TELEVISIONS, IPODS, BATTERY POWERED RIDE ONS, BRATZ, RADIO CONTROL CARS, JEWELRY, AND SO MUCH MORE. BEST OF ALL WE DO NOT PRORATE. WE HAVE ADDED IN 10 PRINCESS SUPREMES AND 3 PRINCE SUPREMES AND MANY ANNIVERSARY SURPRISES. WE WILL CONTINUE TO ADD IN MORE SUPREME TITLES AS OUR CONTESTANT NUMBERS RISE..SO ENTER EARLY.. WONDERING HOW YOU MAY RECEIVE YOUR SUPREME FEE PAID TO THIS AWESOME NATIONAL? REFERRALS: Invite your friends to join you for a great day of fun and excitement (must have never done America's Regal Gems or Perfect Pearls) at ARG 5th Anniversary National and receive $25 off your fees for each friend that enters. . . 5 referrals and your supreme package is FREE. You could also be our Hospitality Model and receive a crown, sash, gift and $100 bond and be featured on the inside back cover of the program book. Contestant with the most referrals over 5 will win this award. AD PAGES: Sell ad pages to all your friends, family and business associates. They get the advertising you get fees paid for.. Ad Pages sell for $50 each with $25 of each ad page going toward your fees. The more you sell the less you have to pay. Sell 11 ad pages and enter by June 30, 2007 and you will receive your Supreme fee FREE and for selling 10 ad pages you will receive your choice of a battery powered ride on (example: Barbie convertible, Dora jeep, Hummer, etc) or an IPOD or a flat screen TV or a digital camera. You could be our Cover Model and receive a crown, sash and $100 bond and be featured on the back cover of the program book.. EVERY contestant that sells 10 ad pages will receive the ride on, IPOD, TV or camera. Contestant with the most ad pages over 10 will receive the Cover Model award. GET YOUR APPLICATIONS IN EARLY AND SAVE SAVE SAVE. You can save over $200 if you enter by June 30, 2007. Enter by June 30, 2007 - Supreme fee only $275 for girls and $175 for boys and you receive one optional FREE. That is Beauty and 4 optionals and you will be entered into the Amethyst Supreme for a great package of gifts. Enter by July 20, 2007 - Supreme fee only $325 for girls and $225 for boys. That is Beauty and 3 optionals and you will be entered into the Amethyst Supreme for a great package of gifts. One girl and one boy will win this award. This is an Early bird only and is FREE. No one will be entered into Amethyst Supreme after the deadline. Winner is contestant with the highest Beauty, Model and Photo score. Enter by August 1, 2007 - Supreme fee only $395 for girls and $295 for boys. That is Beauty and 3 optionals. After August 1, 2007 - Supreme fee will be $395 plus $50 late fee for girls and $295 plus $50 late fee for boys. Deadlines will NOT be extended. Remember at Regal Gems there are no additional fees for any Supreme titles. All awards are presented on stage. WE DO NOT PRORATE. This is going to be one of THE BEST NATIONALS IN THE NORTHEAST. You'll be sorry if you miss it.. Hope to see you all there. DON�T FORGET TO BOOK YOUR HAIR AND MAKEUP, TANNING, COACHING ETC. I am a firm believer in Miracles. I think if we have enough people praying, the Lord will give us a Miracle. Please prayer for my brother. His name is Danny Payne. 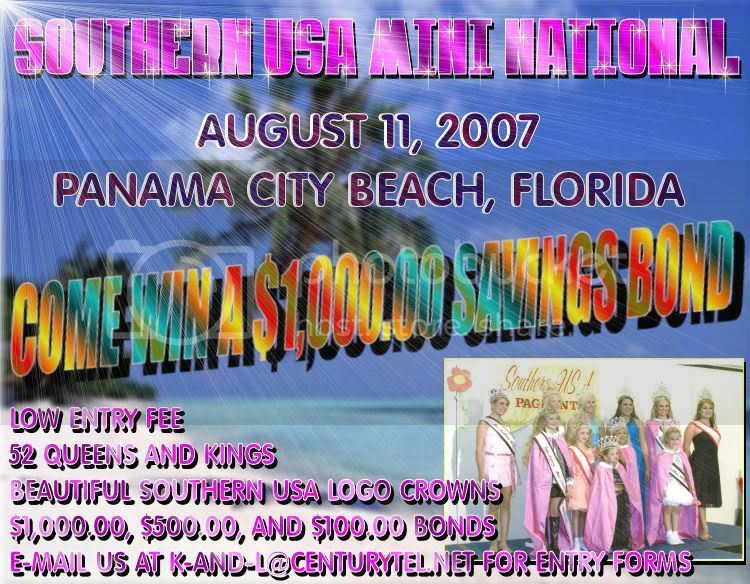 OVER 55 NATIONAL MISS SOUTHERN USA LOGO CROWNS WILL BE AWARDED! Click the banner to inquire! TONS OF GIFTS AND PRIZES.. WE HAVE ADDED IN 10 PRINCESS SUPREMES AND 3 PRINCE SUPREMES AND MANY ANNIVERSARY SURPRISES. COME WIN A $5,000.00 SAVINGS BOND!!! BOOK YOUR ROOM BY MAY 10th AND GET YOUR ROOM FOR $52.00 A NIGHT. U.S. HWY 78 & 21 SOUTH, OXFORD, ALABAMA 36203. THE QUALITY INN IS LOCATED AT THE ANNISTON/OXFORD EXIT #185 ON INTERSTATE 20. THE QUALITY INN IS 60 MILES EAST OF BIRMINGHAM, ALABAMA AND 60 MILES WEST OF ATLANTA, GEORGIA ON INTERSTATE 20. EASY WAYS TO EARN YOUR TRIP TO NATIONALS AND RECEIVE BIG AWARDS!! SELL THE MOST AD PAGES AND BE ALL AMERICAN MISS COVER GIRL OR BOY!! MONOGRAMMED BANNER, A VERY SPECIAL GIFT, COVER GIRL OR BOY PLAQUE AND THE NATIONAL ROBE. CALL: 256-463-4879 AND WE WILL SEND SAMPLE SHEETS. REFER 3 CONTESTANTS AND COME TO NATIONAL FREE!!! LET US KNOW IF YOU NEED A PACK OF ENTRY FORMS TO WORK ON REFERRALS. PLUS GET EVERYTHING PAID SAME AS THE COVER GIRL OR BOY!!! WOW!!! PAGEANT CASH IS THE SAME AS CASH ON YOUR FEES. IF YOU ARE FROM A STATE THAT DOESN'T HAVE A AAM DIRECTOR YOU MAY COME WITH FEES PAID. ASK HOW YOU MAY ENTER FREE!!!! 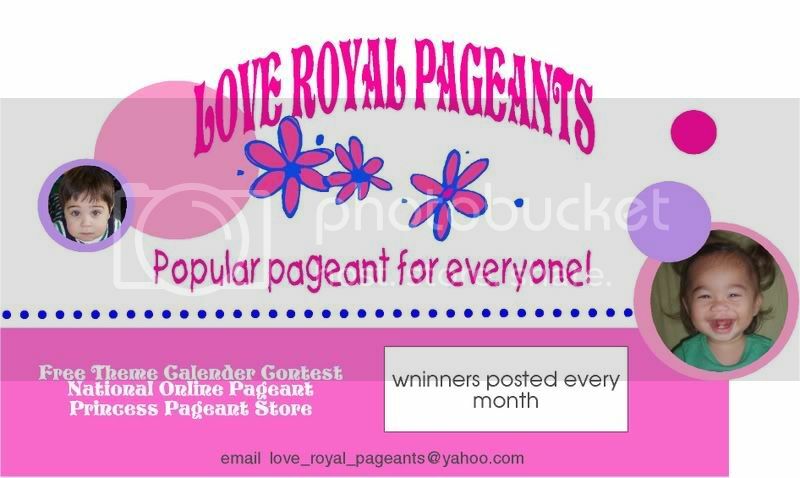 CONTESTANTS THAT GETS THEIR $50.00 DEPOSIT IN BY MAY 10, 2007 WILL RECEIVE THE CROWNING T-SHIRT FREE!! IF YOU REFER MORE THAN 3 CONTESTANTS YOU WILL GET $25.00 FOR EACH OF THEM. REFERRALS WILL NOT BE COUNTED FOR CONTESTANTS ENTERING AT THE DOOR OR IF THEY HAVE DONE AN ALL AMERICAN MISS PAGEANT. 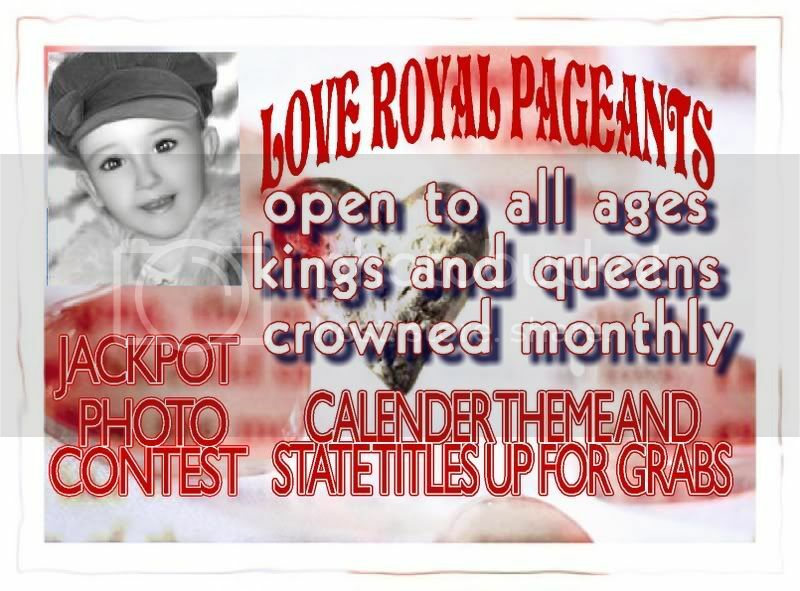 THEY MUST HAVE THEIR ENTRY FORMS IN AT LEAST ONE WEEK BEFORE THE PAGEANT IN ORDER TO COUNT AS YOUR REFERRAL. Custom all AB stoned crowns!!! We will be awarding Tiffany's right in the Little Blue Box!!!! AD PAGES: Sell ad pages to all your friends, family and business associates. They get the advertising you get fees paid for.. Ad Pages sell for $50 each with $25 of each ad page going toward your fees. The more you sell the less you have to pay. Sell 11 ad pages and enter by June 30, 2007 and you will receive your Supreme fee FREE and for selling 10 ad pages you will receive your choice of a battery powered ride on (example: Barbie convertible, Dora jeep, Hummer, etc) or an IPOD or a flat screen TV. You could be our Cover Model and receive a crown, sash and $100 bond and be featured on the back cover of the program book.. EVERY contestant that sells 10 ad pages will receive the ride on or IPOD. Contestant with the most ad pages over 10 will receive the Cover Model award. Remember at Regal Gems there are no additional fees for any Supreme titles. All awards are presented on stage. 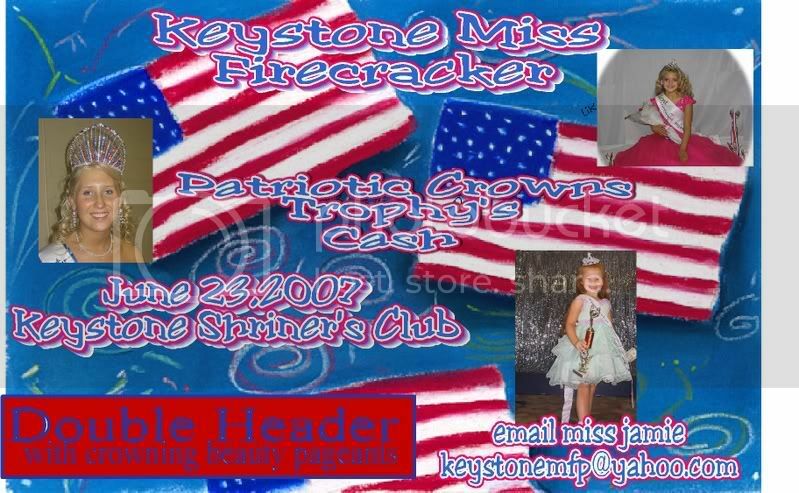 Prizes Include Crowns/Tiaras, Trophies, Banners, Large Gift Bags & Fees Off Florida Open State 2007 . Every Contestant Wil be awarded. Accepting Boys, Girls, Miss and Mrs.
We have 3 posters, so your banners will always be seen! ������������������������� NEED HAIR AND�MAKE-UP FOR THAT�PERFECT LOOK? WE GOT YOU COVERED. The� best stylist are here! Make sure you book early to get a spot with you favorite stylist. Do not see your stylist listed? Call them and tell them you want to go to ROYAL QUEENS OF AMERICA! And you just might enter our pageant for FREE. And everyone who sends in their deposit will also receive a �TEDDY-ANGELS holding a heart in your birthstone! ����������� Royal Queens of America will never cancel any of their pageants. ������������������������������������ We will never PRO-RATE! ���������������������� Don't forget to sign our guest book for a chance to win fees off and a great prize! 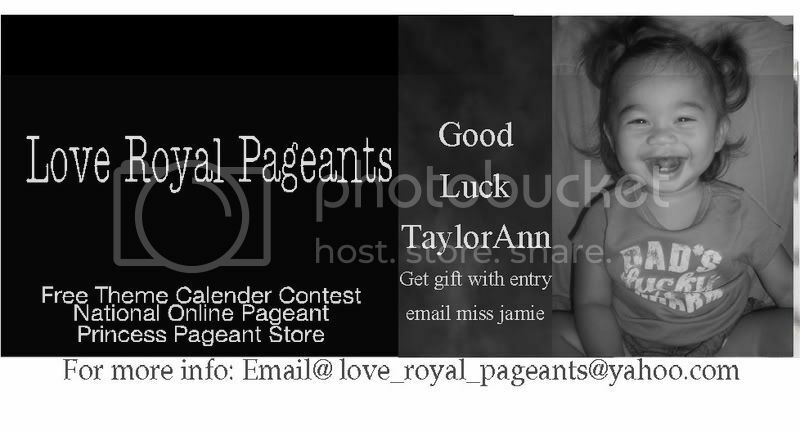 Get your winning photos today!! Every contestant who enters and doesn't win a title will receive a $25 optional at the mini nationals. March 24th DIXIELAND MINI-NAT. STATESVILLE, N.C.
MARCH 30-APRIL 2 MODEL MISS NAT. ATLANTA, GA.
APRIL 13-15 AMBG CAROLINA STATE CHARLOTTE, N.C.
APRIL 20-22 TIARA GIRLS CAROLINA STATE MYRTLE BEACH, S.C.
MAY 26-28 AMBG NATIONAL GATLINGBURG, TENN.
we get your banners posted!